We’re local and we’re proud! Owned and run by Shane Kenny and the Kenny family, The Carpet Store and More have been doing business in Limerick since 2002. 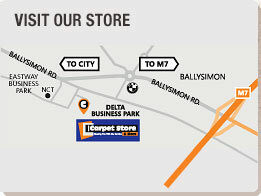 The Carpet Store and More originated on the Dock Road but now reside in a brand new showroom in Delta Retail Park, Ballysimon Road, Limerick. With over 30 years of experience in the flooring business, there’s not a lot that the Kenny family doesn’t know about flooring. The same is true of Seamus, a fellow flooring expert with a 30-year track record. Now we can offer you over 60 years of experience, and that doesn’t even include the skills of our three professional fitters!